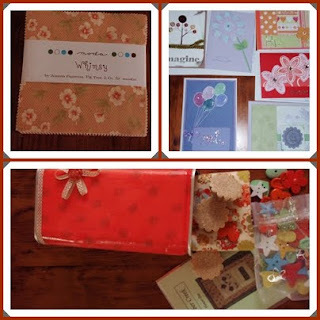 Thank you for joining Our Craft Forum’s blog hop. So what is “Our Craft Forum” a craft forum for like-minded people who love crafts. Mostly patchwork, stitching, quilting and the like. It’s a safe place to make new friends who share a love of craft & to have some fun and a little bit of laughter along the way & to join in on swaps of all types. The blog hop starts at my blog (here) if you want to join us on the whole journey please follow the links at the bottom of each post to find the next blog along the way. 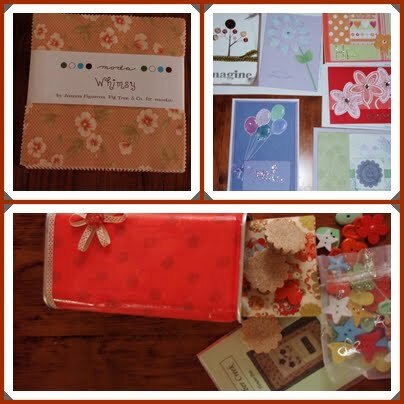 Each person who joins our forum from this blog hop will go in the draw for a craft pack (picture above shows some of the giveaway, including fat Q's, ribbon, handmade goodies and lots of other sewing supplies). So to join our forum, please go to http://ourcraftforum.freeforums.org/ and register. Once you have been activated please leave a message in "Blog Hop Giveaway". Entries close at MIDNIGHT EDST (Sydney time) Sunday 27 February. So join in on the fun and maybe find a new forum, new blog and new friends along the way. You never know you may even learn som ething new or win a great prize. Now to my giveaways, I have 3 giveaways a Whimsy charm pack, 6 handmade cards and an altered tin filled with 1/2 m of Picnic Parade fabric, bright & funky buttons, wall hanging pattern and melts for your incense burner. All you need to do to enter is to leave a comment on THIS post. If you join the forum come back and let me know and I will give you a 2nd entry. Entries will close mindight Sunday 27 February. The next blog is one of my favourite blogs to visit The Pickledish Patch . Pop on over to see what my gorgeous & very talented friend Vicki has in store for you. Oh, lovely goodies that I would be thrilled to win! Gail, your cards are beautiful and I love seeing all the great photographs. I will be back coming to your blog more often. I hope I am not too late to join the blog hop and I will go to the forum and read all about it now. This sounds like fun - even if I don't win anything. Anxious to check out all the different blogs. Also joined the forum and look forward to checking it out in detail. I am a member of the forum now!!! I am a registered member of this forum now too!! I have joined the forum too. What a lovely lot of things to win! Thanks for the opportunity. I just love the cards you create Gail. Thank-you for leading this blog hop and for all the work you have done. I feel it is going to be a success. I'm a fairly recent member to the forum, it will be an interesting couple of days hopping round all these blogs. Nice blog Gail, very pretty. I am really enjoying this! This is great fun, looking forward to seeing all the comments on each blog! This is going to be great fun hopping around meeting everyone. I have joined the forum and it is activated but I could not find where to leave a message in the Blog Hop Giveaway. Your cards are beautiful!! I love giveaways!! This sounds like fun, i look forward to seeing all the different blogs. Lovely! Thank you so much for the give away and the fun with the blog hop! Joined the forum and I am looking forward to it! Thanks for nother chance! I am joining in the hop but could not join the forum. 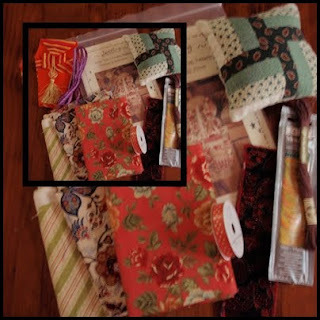 I lobe blog hops.Thank you for the lovely giveaway. I'm not sure how all this will go but looking forward to a craft weekend! I have jumped on the Blog Hop bandwagon and joined the forum too. Looking forward to hopping around the globe with all the great crafters and quilters out there. Thanks for everything! I have joined the forum and have also found new blogs to look thru. Wow, what an amazing give away. I am a new member of your forum. I am loving it. Blog hops are fun! Nice giveaway; Thanks for the chance to win. I love this Blog Hop, it's so much fun meeting new people and their blogs. ooo this is fun.....and I've joined the forum too!!!! New friends, I can't wait!!!! Just joined the forum. Got to keep updated on any thing new you know. Thanks! I'm new to your blog and so happy I found it I'd love to be entered in your giveaway will be back soon! I have joined the forum also! Just love blog hops! Please count me in! I just joined the forum and am looking forward to participating!!! Thanks! I'm enjoying hopping my way through the Craft Forum Bog Hop! Have a wonderful day! I have joined the Forum - Yippee! I love discovering new blogs on blog hops! I have joined the forum. This is going to be great fun reading new blogs and reading a forum. Great prizes to. Hi! Thanks for this awesome idea! I am sure to enjoy the blog hop! I'm now a follower of your blog! Thanks for that too!! Thanks for the chance to win in your wonderful giveaway. I am always happy to find some new blogs to inspire me. BTW I joined the forum too! I think this is such a fun way to discover new blogs. Thanks. I joined the forum and am looking forward to reading through the postings. I am now following your blog. Looking forward to more entries to read! Look at all those goodies you are willing to share :D Blog hops are very fun! ooh, that Whimsy charm pack looks yummy! Thank you for coordinating this fabulous hop! Also, thank you for welcoming me into the forum with warm hands! I joined the forum. It looks like fun. Definitely a great idea and I'm becoming a follower of a few blogs I haven't visited before. Oh This sounds like so much fun. I can't wait to check out the blogs. loving that charm pack Gail. A blog hop is an awesome idea. I had a peek yesterday morning before work and zoomed over to join the forum....exactly what I've been looking for! Well Gail...I'm here at last! I joined the forum on Wednesday or Thursday, so I would be ahead... and then I didn't get here yesterday? How's that for organisation? Crafty people can't be too organised ..lol..
Gail--you have done a terrific job co-ordinating everything. Your blog looks great . looking forward to catching up with my other forum buddies. I'm loving the blog hop Gail.We may need to repeat this again next year?? :) Barb. I need to check out your forum - sounds like fun. thanks for the chance to win some nice goodies. What nice things you have in your giveaway, thanks for the chance to win. I am going to continue on the blog hop. I just joined your forum. This sounds like alot of fun! I'm not sure what I am doing but I will give it a go! Thanks for the opportunity to join in. I have joined the forum too! Computers are amazing things! My Mother has convinced me to blog-hop so I can have a look at all the cool things you ladies do :) I'm impressed by the first blog - can't wait to see what else you girls get up to. Thanks for organising such a great event. I loved exploring your blog. I also just joined the forum. Well here I am ! I don't know why I couldn't leave a comment the other day . I hope you had lots of fun Gail . Hi Gail, I have just joined the Blog Hop and the Forun, looking forward to some fun! The blog hop is a great idea! I have just joined the forum!